Forget expensive facials or spending hours meticulously poring over your pores. When it comes to date night skin care, it doesn’t matter too much how long you have to prep before you head out of the door – your skin can look and feel gorgeous with a few hours or a few minutes prep! When I think of date night skin, I think instant impact. Focus on boosting the healthy look of your complexion, including diminishing signs of fatigue, smoothing the skin’s texture, and brightening up your skin with a fresh and fabulous glow. So whether you’re the sort of person who plans their outfit, hair and make-up days in advance, or you’re a Last Minute Lucy, we’ve got a round up of skincare wonder workers that you can rely on to make your skin positively glow. They won’t know what’s hit ’em! If you’re preparing your skin the night before, then you’ve got time to bring out the radiance big guns! There are certain peeling products that are best used when you have no other plans for that night, as putting makeup on top of freshly treated skin can feel a little counter-productive. Turn off your phone, light a few candles, and dedicate yourself to the art of pampering. Ole Henriksen Power Peel Pods This is Ole Henriksen’s answer to an in-spa facial, offering a three-step ritual that renews your complexion with a smoothing, brightening and clarifying result. First, you manually exfoliate with a blend of almond paste and honey. Next, a chemical exfoliator peels your skin with powerful fruit acids that really smooth skin and enhance radiance. Finally, the third step cocoons your skin in a rich mask of chamomile, evening primrose oil and jojoba seed oil to calm and nourish. Your skin will have never looked better. Caudalie Vinoperfect Overnight Renewal Cream When you’ve got a whole night’s sleep between you and your big evening out, great things can be achieved! 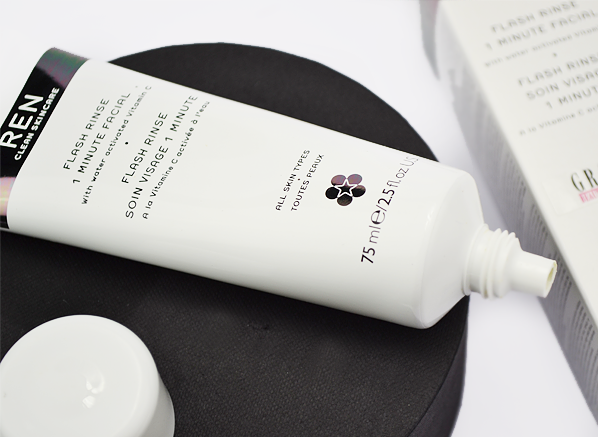 This detoxifying formula is packed full of Viniferine to combat dark spots, papaya enzymes and glycolic acid to smooth and brighten, and hyaluronic acid to plump and moisturise. It’s essentially 8 hours of sleep in a tube, ensuring that your skin looks vibrant and healthy for the next day. 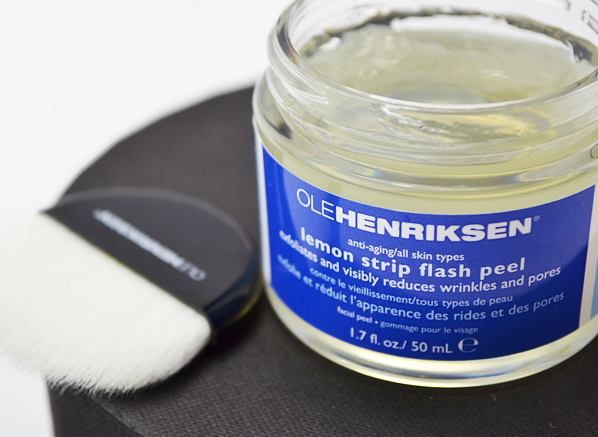 Ole Henriksen Lemon Strip Flash Peel This resurfacing treatment provides intense exfoliation and brightening power in one amazingly effective step. Its blend of lactic, glycolic and fruit acids nibble away at dead skin cells whilst brightening, tightening and evening-out the skin, so you’ll be looking fresh and rested in a flash (10 minutes in this case). Make sure that you follow up with a moisturiser or an SPF after use, as your skin will be more sensitive to the sun. Nuxe Splendieuse Anti-Dark Spot Perfecting Mask x 6 These ultra-handy masks from Nuxe not only offer all of the intensive hydration and plumping care that you’d expect from a sheet mask, but they also include an infusion of anti-dark spot active ingredients that enhance radiance and even out the complexion. Simply line up the sheet mask with your features, relax for 10 minutes, and then massage any excess product into your skin. It’s an express treatment and relaxation aid in one! You have limited time before you need to rush out of the door to meet your date… and your radiance game is pretty much at zero. There’s no time to beat around the bush – you need a product that will work double time to transform the texture, tone and brightness of your skin, and make the rest of your pared-back routine easy breezy. 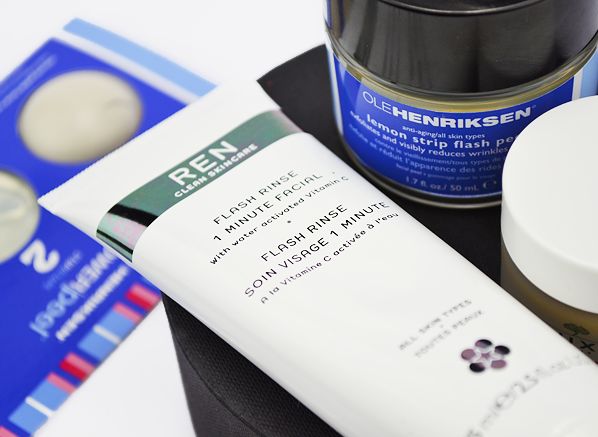 REN Flash Rinse 1 Minute Facial This wonder product does what it says on the tube. Its quick-as-a-flash boost of radiance is powered by potent water-activated vitamin C, which works to brighten dull skin and erase signs of fatigue while an infusion of boswellic acid smoothes out fine lines for an overall fresher look. Simply apply to dry skin, massage with damp hands to activate the vitamin C, leave for a minute and then rinse. You’ll be positively glowing. Givenchy Hydra Sparkling One-Minute Glow Powder A touch of exfoliation always does the trick when you need to smooth your skin’s texture. This super-charged powder exfoliator from Givenchy doesn’t just offer a luxurious take on manual exfoliation, oh no. Its ultra-fine micro crystals are also infused with a blend of AHA and BHA acids, which provide a really effective micro-peel effect. Simply add a little water to the powder, massage into your complexion, and rinse. It’s energy for your skin, bottled. You’re already on your date, but you need a little pick-me-up to keep your glow and your confidence boosted. These date night skin care heroes will perk everything up and make sure that you look and feel your best. Caudalie Beauty Elixir This cult skincare spray is so perfect for a little boost of energy. Its aromatheraputic blend of orange blossom, rose, mint and grape essential oils is based upon the legendary elixir of youth that was used by Queen Isabelle of Hungary, and works to tighten pores and give skin a beautiful glow. And as an added bonus, this versatile little spray is perfect for setting your make-up! 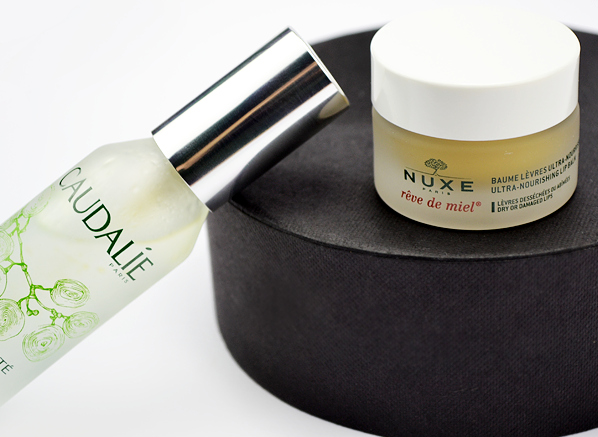 Nuxe Reve de Miel Lip Balm So, your skin is looking pretty radiant by now. But how are your lips shaping up? Date night was made for kissing, so a chapped pout is a big no-no. Slather on some of Nuxe’s iconic Reve de Miel Lip Balm with its intensely nourishing formula and matte finish, and you’ll have the smoothest lips around. What’s your date night skin prep routine? This entry was posted on Tuesday, February 16th, 2016 at 11:54 am and is filed under French Pharmacy, Skincare. You can follow any responses to this entry through the RSS 2.0 feed. You can skip to the end and leave a response. Pinging is currently not allowed. LOVE this post. You have some great products here. I usually go for some kind of moisturizing/plumping mask (I like the Glossier one at the moment).